In an intimate venue, the audience is greeted by a man reclining on a chair; part-babysitter, part-caretaker, whose 'work', as he has it, seems to be guarding tiny, invisible fairies as they sleep. Around him stand delicate items from an old doll's house and a few antique cabinets – each housing one of the fairies, and he does his rounds of each, tucking its inhabitant back in or letting them out to play. Anyone who has experienced Andy Manley's similar play for small children, White will know that such a description doesn't sum up the sheer invention at work in his new production. Co-created with Bjarne Sandborg, made with Denmark's Teater Refleksion and aimed at 3–6-year-olds, Night Light is a quieter affair than White, and doesn't have quite the same dazzling reveals. Yet it remains a powerful piece of stagecraft which is to be cherished all the more for the masterful way Manley controls the volume and the sense of wonder in the room. He's a sublime silent comic, a physical performer of grace and pathos, and every delicate movement is integral to the piece. 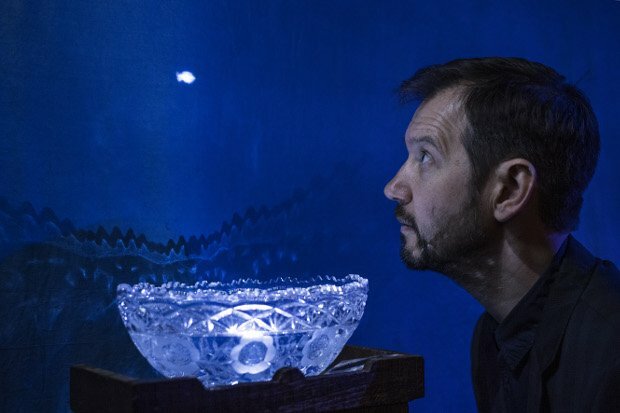 Anders Kjems' lighting, hidden in the set and pressed against the backdrop, provides simple but impressive visual effects, revealing a fairground in the furniture, a roaring log fire, a shadowplay jungle of fierce creatures and – best of all – a glowing fish which jumps from the wall into Manley's hand. Once again, the gold standard in pre-school theatre is on his stage.